1 of 5 Prepare outdoor grill with hot coals, or heat gas grill to hot, or heat oven to broil. 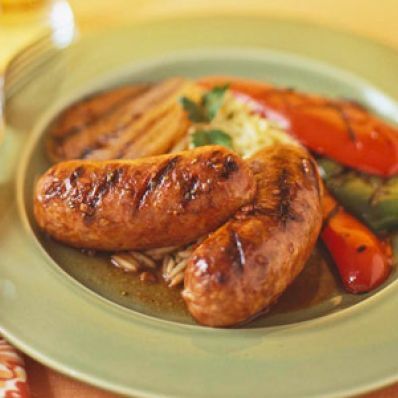 Grill or broil sausages 6 minutes on each side, or until internal temperature registers 145 degrees F on instant-read thermometer. 2 of 5 Meanwhile, heat butter in small saucepan. Add garlic; cook over medium-low heat to soften, 3 minutes. Add 1 cup chicken broth, Marsala wine, salt and pepper; cook over high heat until slightly reduced, 5 minutes. Stir in thyme. Remove from heat. 3 of 5 Reserve half of Marsala mixture. Brush onions and peppers with remaining mixture. Grill or broil until softened, about 8 minutes, turning vegetables over and brushing with mixture halfway through cooking. 4 of 5 Stir cornstarch into the 1 tablespoon chicken broth in small cup. Bring reserved Marsala mixture to a boil in small saucepan. Stir in cornstarch mixture. Boil sauce for 1 minute. Remove saucepan from heat. 5 of 5 Cut sausages into serving pieces. Arrange sausage, onions and peppers on platter. Drizzle Marsala sauce over top. Serve with orzo garnished with parsley, if desired. Per Serving: 12 g Fat, total, 15 g carb., 5 g sat. fat, 134 mg chol., 12 g fiber, 757 mg sodium, 20 g pro., 241 kcal cal.